This is a 2-up for the 8D8 figure, meaning that it is a hardcopy that is twice the size of the actual figure. 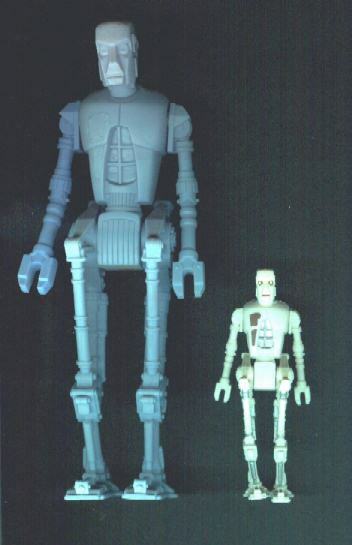 The 8D8 and EV-9D9 figures were cast in twice the actual figure scale, perhaps due to the intricate leg joints that would have been difficult to sculpt in actual size. Note that it is in blue. This 2-up was made in the early 90s, so it is not an original from the Kenner line, although it was made from original hardcopy for the figure. Some dealers have been passing off similar blue hardcopies claiming they were originals from the old line. This is a lie. This 2-up was purchased with the full understanding that it was a repro of original Kenner prototypes. 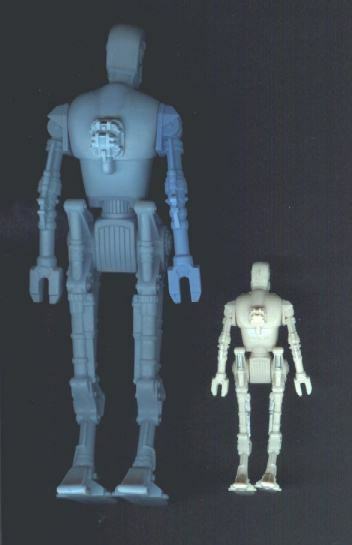 None of the figure 2-ups or micro collection 4-ups from the original SW line were cast in blue plastic.